AVS Engineering Co, is Manufacturers, Exporters and Suppliers of Industrial Machinery and Plants like PSA Nitrogen Gas Plants, PSA Oxygen Gas Plants, PSA Hydrogen Gas Plants, and Bio Gas Purification System. This Process consists of 2 Vessels filled with Molecular Sieves (MS) and Activated Alumina. Clean Compressed Air at30°C temperature is passed through one Vessel and oxygen comes out as product Gas. The exhaust Gas (Nitrogen) is discharged back into atmosphere. Upon saturation of the Molecular Sieves bed, the process switches oxygen Generation to the other bed by automatic valves while allowing the saturated bed to undergo regeneration. by depressurization and purging to atmospheric pressure. This is 2 vessels keep cycling alternately in oxygen production and regeneration ensuring oxygen Gas is continuously available to your Process. Color and B & w picture tube/ glass shell Industry. Lamp/ compact fluorescent lamp Industry. Effluent & waste water treatment. For lancing In steel Industries. Purity up to 95% is easily achievable. 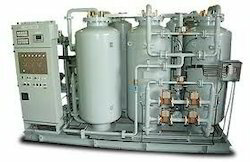 Oxygen Gas Generator. Technical Specifications: Purity : Up to 95% Capacity : 1Nm3/hr to 200Nm3/hr Pressure : Up to 4 Bar without oxygen Booster Dew Point : up to (-) 40C PSA Principle .This Process consists of 2 Vessels filled with Molecular Sieves (MS) and Activated Alumina. 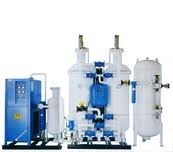 Clean Compressed Air at30C temperature is passed through one Vessel and oxygen comes out as product Gas. The exhaust Gas (Nitrogen) is discharged back into atmosphere. Upon saturation of the Molecular Sieves bed, the process switches oxygen Generation to the other bed by automatic valves while allowing the saturated bed to undergo regeneration. by depressurization and purging to atmospheric pressure. This is 2 vessels keep cycling alternately in oxygen production and regeneration ensuring oxygen Gas is continuously available to your Process. 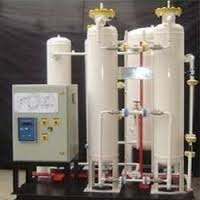 Continuous, Supply and Guaranteed Purity .When you installed the PSA Oxygen Gas Plant on site, you are in control of your Oxygen Supply if you are currently using cylinder, than there is always dependence on your suppliers and there is no guarantee of the purity of oxygen being supplied. With PSA System, you can be sure of the purity of oxygen with the included oxygen purity analyzer Application Used. Color and B & w picture tube/ glass shell Industry. Lamp/ compact fluorescent lamp Industry. Vials & ampoules. Brazing application. For Fish farming. Effluent & waste water treatment. For Chemical oxidation. Ozone Generation. LPG enrichment. For lancing In steel Industries. Effluent & waste water treatment. For Chemical oxidation. Ozone Generation. LPC enrichment. For lancing In steel Industries. For chemical oxidation. Salient Features. Fully Automatic. No fuel is required. Low capital & running cost Purity up to 95% is easily achievable.